How do I assign Roles in Shared Locations? How do I give staff access to multiple locations? It may be that your staff member is an employee in one location and a manager in another. Or it may be that they are a manager across multiple locations and need access to all of them. You must first share this employee across the different locations. This article will show you how to do this. Please note, you must have access to the 'Roles' section of the employee profile to do this. Click on the location from the dropdown. Go to the 'Role' tab. Select the role and save. 4. Answer "Yes" to the popover, if you would like to share this role across all of their locations. 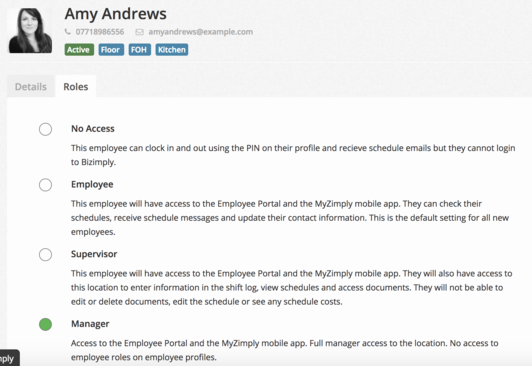 Your employee will now receive an email from Bizimply, notifying them of their access for each of their shared locations.